Curious people that we are, the crack Calcbench staff decided to spend an afternoon nosing through recent Form 8-K filings, looking for juicy severance agreements where departing executive officers received golden parachutes bigger than anything we’ll ever get. You can do that on Calcbench now that we offer fully searchable Form 8-K filings. Let’s show you how. First, we set our peer group to the S&P 500 and decided to search filings made in first quarter 2018. Then comes the 8-K part. 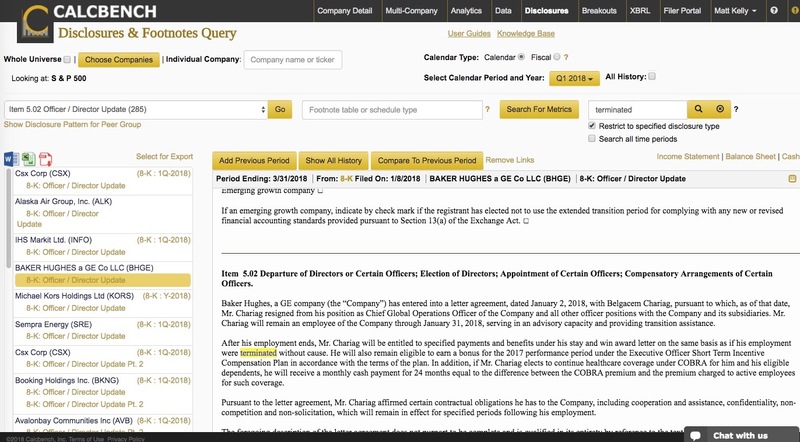 To search those disclosures, open the “Choose footnote/disclosure type” menu on the upper-left side. Then scroll to the bottom, where you’ll see all the Form 8-K disclosures you can find in Calcbench. On Jan. 8, Baker Hughes filed a separation agreement with Belgacem Chariag, who resigned his post as chief global operations officer. His agreement stipulates that if he uses COBRA for health insurance, Baker Hughes will pay Chariag the difference between COBRA premium and employees’ premiums for two years. Michael Kors Holdings filed an agreement on March 30 that renewed the contract with Michael Kors himself, honorary chairman and chief creative officer. Kors cannot be fired without cause; he receives free healthcare and a personal driver; and if Kors ever quits on his own volition, he gets a $1 million annual salary for the rest of his life. On Feb. 6 Wynn Resorts filed the separation agreement it reached with now-former CEO Stephen Wynn, who resigned (on Feb. 6) after a Wall Street Journal expose that accused him of a long history of sexual assault. Wynn received paid company healthcare through the end of 2018, a personal assistant through May 31, 2018, and use of a private villa at Wynn Las Vegas until June 1. Our point isn’t to show you all the gossip stuff you can find in Form 8-K filings, although lord knows it’s fun. Rather, the Form 8-K filing is a source of rich information and detail — and in many cases, is often filed long after whatever headline news sparked the public’s interest in the first place. That’s true of mergers, executive departures, lines of credit, and other items routinely included in Form 8-K filings. All you need is a clear sense of what you want to search for. Then visit the Calcbench Interactive Disclosure database, and we can guide you from there.